George Galloway has recorded a stunning victory in the Bradford West by-election, securing a 10,000-plus majority in what he called a "total rejection" of the three main parties. In his victory speech, the Respect candidate said the result "represents the Bradford spring" and had earlier called his win the "most sensational victory in British political history". By the Grace of God we have won the most sensational victory in British political history. 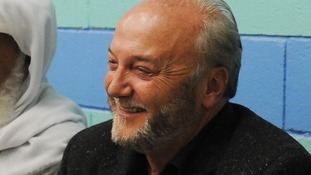 Mr Galloway picked up 18,341 votes compared to 8,201 from his nearest-rival, Labour's Imran Hussain. That leaves the Respect party with a 10,140 majority on a swing of 36.59%, turnout was just over 50% at 32,814. The result is a blow to Labour who entered polling day as the overwhelming favourite to retain the seat at the end of a fraught week for the Government. Instead, it became the first Opposition party to slump to defeat in a mid-term poll since the Liberal Democrats took Romsey from the Tories in 2000. Party sources pointed to a massive slump in the Conservative vote as evidence of the government's unpopularity. The Liberal Democrats lost their deposit.